"The Shrine of Shortline Railroading"
From 1910 until 1961, the city of Sevierville, Tennessee, nestled in the foothills of the Great Smoky Mountains, was served by a railroad of its very own. This shortline, built in 1908 and 1909 to standard gauge, linked then-remote Sevierville with the nearby commercial and industrial center of Knoxville, some 30 miles distant. 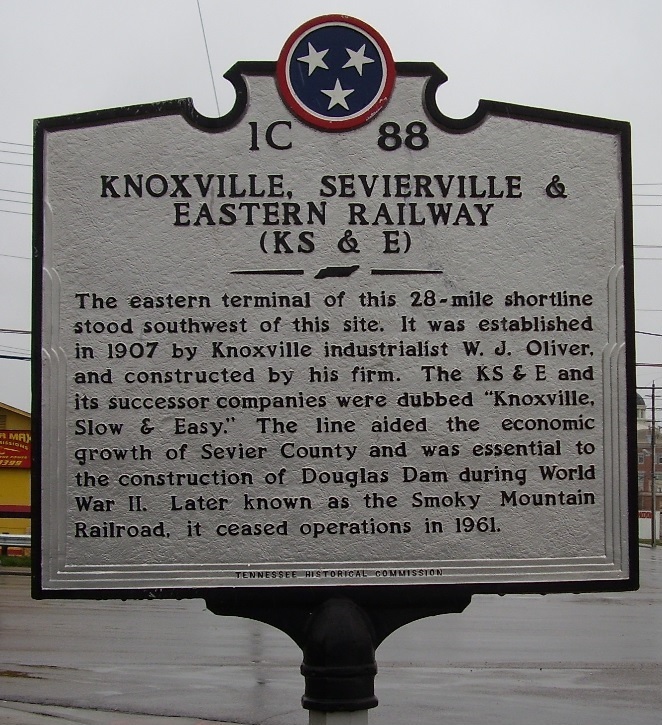 Originally dubbed the Knoxville, Sevierville & Eastern Railway, locals came to know the KS&E as the "Knoxville, Slow & Easy" (or just "Slow & Easy"), given the unhurried pace of its trains. Unfortunately, financial and/or legal troubles plagued the line's entire existence, and both its name and ownership changed through the years. Its first sale resulted in its renaming as the Knoxville & Carolina Railroad. Then came the Smoky Mountain Railroad, itself a holding company which leased the route as the "Knoxville Division" of the larger Tennessee & North Carolina Railway. For its final two decades of operation, the line operated as the Smoky Mountain Railroad, the name by which it is most commonly known today. Regardless of its corporate name, however, the railroad's "Slow & Easy" moniker stuck. In fact, many longtime residents of South Knoxville and Sevier County still use that nickname in referring to the long-abandoned route. For the sake of completeness, it should also be pointed out that, from 1919 until 1929, the railroad extended beyond Sevierville and Pigeon Forge to McCookville. This extension, constructed mostly to haul timber and iron ore out of the area, was operated by a separate, but affiliated, company, the Pigeon River Railroad (not to be confused with the Pigeon River Railway of North Carolina. Once those two natural resources were depleted, the Pigeon River segment was abandoned. From the early-'Forties until its 1961 abandonment, railroad authors, photographers, and railfans in general took considerable notice of the struggling "Slow & Easy." While most Class I railroads were already operating diesel locomotives and streamlined passenger cars, the Smoky Mountain stuck to light steam locomotives until 1955. Its antique, wooden rolling stock was of the type one might expect to see in a Hollywood Western movie. Most notably, though, the employees of this independent shortline exhibited an indomitable spirit and great pride in their work, even while laboring continously to keep one daily round-trip train running on uneven tracks and rotting trestles. Of the many known book chapters, theses, and articles written about the "Slow & Easy," one Trains Magazine piece summed it up best. Author William H. Schmidt, Jr., after riding the Smoky Mountain Railroad and visiting with its dedicated employees, declared the property to be "the Shrine of Shortline Railroading." Our State of Tennessee Historical Commission highway marker, erected in Sevierville during 2006.